Speaker Kriss Akabusi - Keynotes on sport, motivation and teamwork. "Kriss was very engaging and motivating and he involved everyone in the activities. It was clear he had researched about our company to understand our requirements." Keynote Speaker Kriss Akabusi is famous for his achievements in athletics where his greatest individual triumph was his Gold Medal in the 1990 European Championships when he also beat David Hemery’s 22 year old British Record. Kriss Akabusi is the ideal motivator, ceremony host or coach for any type of audience. Kriss Akabusi began his international athletic career in 1983 as a member of the 4×400 metre relay squad and will probably always be remembered for helping Britain clinch the Gold and beat the Americans in the World Championships 4×400 metre relay in Tokyo in 1991. He is also an accredited personal coach, having qualified at the Hudson Institute of Santa Barbara. 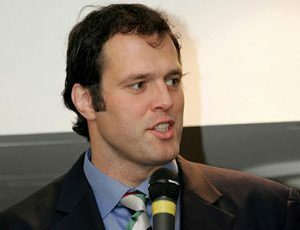 He is one of only four qualified Hudson Institute coaches in the UK. 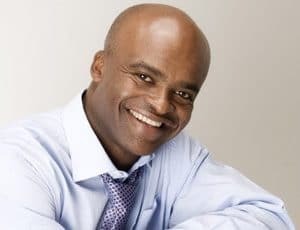 Kriss Akabusi born in London in 1958 of Nigerian parents he has three children, two beautiful girls from his marriage, Ashanti and Shakira and Alannam, a son and welcome addition to the family. Currently living in Bedfordshire where he can be found Teeing off at the local Golf Clubs or avidly supporting his favourite football team West Ham United. He is the founding Director and Chairman of TACT (The Akabusi Charitable Trust) a charity that promotes the social and economic development of communities in poverty in Nigeria. TACT, working with local partners and NGO’s, funds projects in the areas of health and education, water and sanitation, and social enterprise, supporting sustainable projects that can make a real difference. Kriss’ infectious enthusiasm ensures that the messages hit home and motivate the audience. Kriss’ inspirational story is legendary and works well as a keynote at the start of a conference to fire up the delegates or as an endnote to close the meeting. I’ll leave the audience on a high, ready to deliver success in the arena. Let’s get ready to rumble at your awards evening. I’m not the star, merely the hired hand when it comes to company and association awards evenings. My job is to ‘big them up’, bring energy, enthusiasm, pride and passion to your awards evening. One of the reasons that athletes are passionate about what they do is because they know there is a final whistle, a call to account for what they have done or accomplished. Yet most us play the game of life as if there is no end, we are sort of sleep walking. Then a sudden jolt, a near death experience, the loss of a loved one, a redundancy at work, a bust up with a long term relationship, and we are rocked wide eyed back into the real world, and can find ourselves in “the doldrums” a toxic place. What do I need to do to make this life my master piece? Socrates is quoted in Plato’s dialogues as saying, “The unexamined life is not worth living”. Together we will help you examine your life, take stock of where you are and chart out where you want to go. We will let go of what is not working, hold on to the great stuff within and around us, take on new learning, experiences and people then move on to our next arena with passion pride and a can do attitude. I like to help people be the CEO of their own career and live their authentic life; the sad thing is that most people will spend more time thinking about booking their holidays than charting their life. Those entrepreneurs or people who want to make the most of the brief sojourn on terra firma often sense something is blocking their progress, and when they recognize that circumstances won’t improve on their own, they’re ready for a coach to be part of their dream team. All it takes is an identifiable challenge and a willingness to change so are your ready or will you wait until the final whistle? Kriss was very engaging and motivating and he involved everyone in the activities. It was clear he had researched about our company to understand our requirements.